Facebook and I have an interesting relationship. I’ve been on it quite some time, and have lots of “friends” (more accurately, friends and acquaintances). However, I do find it useful for keeping up with what this extended group are up to. And if you’re organising a social event, then it’s a useful resource to help you out. You can share pictures or video relatively painlessly, and you can send messages to your “friends”. On the other hand, it has some of the most tortuous settings in any website or application I use. And it changes these regularly. So you’re never totally certain how many people you’re sharing something with. If you’re the kind of person only wants some people and not everyone to be able to read or view something (happily I’m not, but then I’m not 15 with parents and grandparents also on the service), this is quite a palaver. And then there’s all that Facebook data that they’re tracking to monetise it. They want to know everything about you, and given the personal data you share in your status updates (even ones you type but don’t post), you’re giving them a very valuable insight into your world. Their newest plan is to do a Shazam-style analysis on any media you play with your portable device so they know more about your music and video watching habits. None of which really explains the picture at the top of this page. I have the Facebook app installed on my Android mobile phone (Nexus 5, since you ask). And what you need to know is that I have everything on it turned off. I don’t want it running in the background. I don’t want constant notifications from Facebook. I don’t want to share my contacts with it. I want as little as possible to do with it. Partly that’s because it has been a battery-sapping mess of an application. Recently it might have improved somewhat, but I’m not going to take the risk. Indeed, the only reason I have it installed at all is because it’s a mildly better and more convenient experience than the mobile web. But that’s about it. Incidentally, I’ve never bothered installing the Facebook app at all onto any of my tablets. That’s how little I think of it. But then, I’m not a massive Facebook user. Most of my interactions on Facebook come because I’ve linked my Twitter account with it, and anything I post on Twitter gets carried over onto Facebook. Some people respond on Facebook, and I respond to them. Because I don’t have a Facebook app alerting me, I tend to use that oldest of old-school techniques for determining whether someone is talking with me – email. I’m happy to receive as many notifications via email as Facebook wants to send me, because I use filters and rules to put them into a sub-folder keeping my inbox clutter-free. Now it’s true that Facebook emails are pretty terrible. Perhaps deliberately so? It may send an alert within minutes, but quite often it’s hours, or even days after the event. Well their loss. I guess I spend less time on the platform because they can’t be bothered to put the infrastructure in place to keep me up to speed. Still, as I say, I do occasionally use Facebook to message people. While email is my primary communication mechanism, I don’t always have an up to date email address of everyone I want to communicate with. So like Direct Messages in Twitter, I will occasionally send a message. Perhaps more often, I receive messages from others who like to use that facility. But what I don’t want to do is chat. OK. That’s a bit mean-spirited. But I find chat can be quite disruptive. There’s an expectation that someone is available for an instant reply all the time. Chat says to me that it’s more important than anything else I’m doing and since nobody can multi-task (really – they can’t), I should abandon what I’m doing to type as quickly as possible into a small box on a slightly cluttered screen. Look. Microsoft Office email alerts are disruptive enough – “You’ve got mail! It’s more important than that document you’re writing right now, so we’ve flashed it right over where your cursor is!” – but they can be turned off. More to the point email or text messages can be responded to in a timely fashion. I.e. At my convenience. When Facebook introduced chat, I switched it off. Facebook, of course, turned it on for everyone by default. That’s another problem with Facebook. And it’s why as much as anything, it’s an issue of TRUST. And I don’t trust Facebook. They’ve yet to earn that from me. Similarly, I don’t bother with WhatsApp or any of the other numerous messaging applications. I have Skype, but it requires scheduling with me if you want a chat. It’s not running by default. Background apps sap memory and battery. I leave them off. (And incidentally, I think it’s most recent Android version of Skype that “broke” my phone, so it’s not currently even installed there). OK – I admit that I can be reached by Google Hangouts. But there are few enough people who do that, so I’m fine with it. 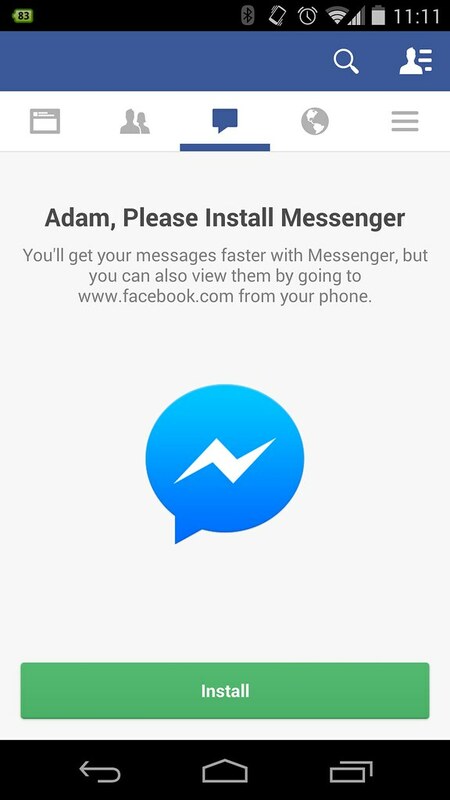 All of which brings me back to Facebook’s Messenger app. Facebook sees messaging as “chat”. But I only ever used it for “email”. They consider the two the same. And that’s where we fell out. By default, if I want to send a long message – even on desktop – I get the tiniest of tiny boxes to type into. No doubt Facebook would say that the average user message is no longer than a text. Well mine are. So you’re already annoying me in the desktop environment. Now on mobile you’re making it worse. Now Facebook has removed basic messaging functionality from its phone app. It still has an icon. But you’re “forced” to install a new app. It has been prompting me for weeks with pop-ups and banners. But now it’s gone. I should install their new app because what kind of social media site doesn’t need more than one app? I don’t want to be made available for Facebook chat. I don’t like your battery hogging apps in general. I don’t like the hoops and complexities of your settings. I don’t TRUST Facebook as a company. All I want to be able to do is read and send occasional messages in a form not dissimilar to email. Yes – I know you could argue the same of Google Drive. They’ve recently dissembled a generic “Drive” app into constituent “Sheets” and “Docs” parts. But then reading and editing documents are very different things. And I know that it’s part of a bigger play about separating key apps from the OS because Android handset manufacturers can be very tardy rolling out OS updates. That all said, I’m not 100% won over by Google either. And yes, I realise that I’m using a completely free service, and nobody is forcing me to use Facebook. As I say, I do like some of their functionality. I just don’t buy into everything they do. Quite a lot of it actually. And their view of messaging/chat in particular. I completely understand that other operators – notably Google – are just as good at hoovering up vast amounts of data including some of the most personal things I talk about because they’re my email provider. I suppose I just trust Facebook less. I’ve been using the Moves app on my phone a lot recently. It’s a great app that uses your phone’s accelerometer and GPS to determine your location and how far you’ve walked, run or cycled. But when Facebook bought them, that didn’t exactly fill me with excitement, even though when they wrote to me, Moves explicitly stated that they weren’t rolling accounts together. (Well, not yet). Hi Adam, given your views on Facebook, why don’t you delete the official app like me and download the Tinfoil Facebook app instead? A good question. Others have mentioned it to me in the past. I may well explore some of the unofficial variants. What I like about Tinfoil for Facebook is that it requires barely any system permissions. “I don’t TRUST Facebook as a company.” That. A wise man once said if you’re not paying for the product you are the product. I deleted my account many years ago and haven’t looked back.